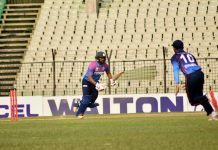 Prime Bank Sporting Club, Shinepukur Cricket Club and Gazi Group Cricketers have sealed victory in the 9th round of Walton Dhaka Premier Division Cricket League 2018-19. Result : Shinepukur Cricket Club won by 2 wickets. Result : Prime Bank Sporting Club won by 172 runs. Result : Gazi Group Cricketers won by 9 runs.